New Milestone – $600/month in Dividends! That’s right! If I never added any additional capital to my portfolio, I should receive on average $600/month ($7200/year) in dividends. This amount is also growing at a rate higher than inflation due to buying high-quality companies with histories of paying increases each and every year. The great part is that it’s taken less time for me to get to $600/month from $500 than it did the previous $100/month increase from $400 to $500. On April 2nd, I broke $4800 ($400/month) in annual dividends. It was on June 25th that I broke through the $6000 ($500/month) mark in annual dividends. That’s almost 3 months. This time around it only took from June 25th to August 27, barely over 2 months. Now I’m sure this has a lot to due with a difference in new capital being deployed but it also has to do with the compounding effect of more dividends rolling in each month. The dividend snowball is in effect and I can’t wait to hit the $1000/month mark. At this pace, it will be around April of next year. Thats very impressive! I follow your blogg. I have reach 380usd/month in dividend. Thanks! I’m happy you stopped by to comment. $380/month is great. It looks like you are doing a great job yourself. That’s some amazing progress, and as your picture suggests those dividends will start to snowball to even greater results in the future. I’m just getting started on my journey myself and I’m just trying to reach that $200/month mark. Your an inspiration. Keep up the great work. I appreciate the support and I’m glad that what I’m doing can motivate others. With a good savings rate and consistent investing, you will be at that $200 mark sooner than you think. Awesome — that dividend snowball is rolling faster and faster! Indeed it is, It’s great to see the consistent quarterly increases in dividends. I’m trying to create as large of a snowball as I can by the time I hit 40. You’re straight up killing it. 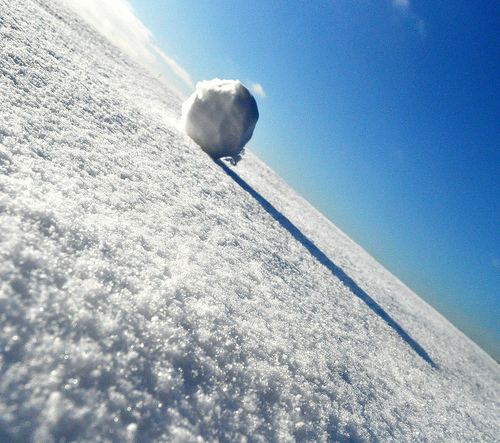 That snowball is going to turn into an avalanche here pretty soon. Keep up the great work! An avalanche, I like that! Thanks! You’re two years away but I’m also two years closer to 40 so you have a little more time than I do. I hope to hit that $1k mark in the first quarter of next year. We shall see. You definitely have life by the balls! Great job, you’ll be financially independent before you hit 40. What are your favorite stocks in your portfolio? Which stock has been your top performer thus far? Also what type of income do you make from your day job? Just curious. I don’t think I’ve seen you comment here before but I hope you stop back by again. Favorite stocks? Wow, that is a tough one. I’d put JNJ and KO up at the top just for the number of years of consistent dividend raises. I’m also a fan of VZ for the larger dividend and because I’ve used their services for 10 years. Keep up the great work AAI! Div increases are going to start having causing some good jumps in you annual div number. Looking forward to your $1000/ month post! Thanks man. I’m trying to catch up with you if that’s possible 🙂 I agree that the monthly dividend income is going to start helping speed up the process. I’ll just keep compounding these dividends all the way to FI. I hope I can hit that $1000 mark first quarter of next year. That may be pushing it a little though. Thanks for the support. You are killing it yourself. Wow, this is outstanding! I wish I could get there fast! Congrats. Persistence will soon pay off. Just keep adding more capital on a regular basis and you’ll be there before you know it.